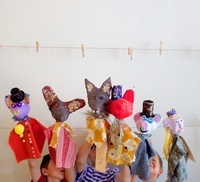 Classes | Purple Twig: Art Exploration for Kids! Our camps are intimate with a ratio of 3 teachers to 16 kids. After beginning the day playing games and drawing to warm up, we then all dive into art making Each week besides our themed artwork we make books, spend some quiet time reading, spend time exploring our neighborhood through scavenger hunts and searching for and gathering our art materials. Our Thanksgiving camps are a one day camp. Join us for one day or for all three. Our winter and Spring Break camps are weekly camps. We offer 11 weeks of summer camp beginning June 17th. We will begin registration for summer beginning in February. For all weekly camps we ask that you register for the entire week. No single days. Our camps fill fast. We do need to receive payment for camp in order to save the spot. Please email me with an issues you may have with payemnt online- info@purpletwig.com. In this week we will be celebrating spring, exploring bugs, making large paintings and small sculptures. We will also be creating individual art projects and collaborative ones. We will have morning journal time then a snack. We will then work on a larger project, hike through the neighborhood or doing a treasure hunt. The rest of the day will be reading, playing games and finishing up or starting an art project. Large scale drawings, tiny drawings, plein aire drawing, self-portrait drawing. We will use a variety of materials, charcoal, pencil, watercolor, chalk pastels to make sculpture drawings, narrative drawings, still-life drawings. We will play a lot of drawing games and work together to make a large scale collaborative artwok. We will be mixing, stirring, making creations in our own apothecary. The kids will have the opportunity to discover the magical, healing, aromatic, and delicious properties of plants and herbs. Students will make salves, candles, soap, teas as well a some magical made up potions. This week of camp is FULL- if you would like to be added to our waitlist, please email us at info@purpletwig.com. Students will be both using natural materials to make sculptures and drawings, materials like leaves, rocks, sticks, feathers, as well as going into the neighborhood to create artworks. Weaving, stacking, and drawing are just a few of the methods we will be using. 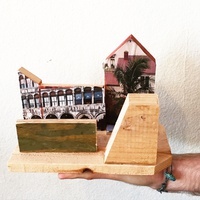 Make your own Doll House or Fort beginning with a wooden house frame. 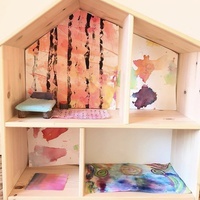 Using art techniques to decorate the house, kids will learn printmaking techniques to make wallpaper, painting and color mixing to paint the rooms. We will make furniture and little paintings, rugs and much more. This is a great week for those who enjoy 2-D techniques of drawing, collage and printmaking. We will learn some simple bindings to make accordion books, flip books, pop up books and more. We will make our own stamps and printing plates to print on fabrics to make banners, on cardboard to make sculptures. We will do mono-printing, foam printing and printing from everyday objects. We will be building, building, building during this week. Students will build towers, bridges, art museums and parks. Building with wood, with clay, with cardboard and recycled materials. Students will also be creating drawings and collages for the structures we build, making the transformation from 2-D to 3-D and sometimes back to 2-D. Exploring paint and its many forms will be the subject of this week, watercolor paint, tempera paint, sumi ink, powdered paints Kids will make large scaled paintings, collaborative paintings, self-portrait paintings, abstract paintings, black and white paintings. We'll also explore color by mixing our own paints. During the week we will transform ourselves into puppeteers, creating not only puppets of various sizes from various materials, but also theaters for the dramas to take place. Students will learn puppetry from around the world and have a chance to make shadow puppets, hand puppets made from plaster, sock puppets and marionettes. Students will spend the week creating scultpural treats, from donuts to fruit towers. We will be making cake painting and fruit prints. This is a week of using a large variety of both sculptural and 2-D mediums.